Darren Foreman, better known as Beardyman, is a British multivocalist, musician, and comedian from London renowned for his beatboxing skills and use of live looping. 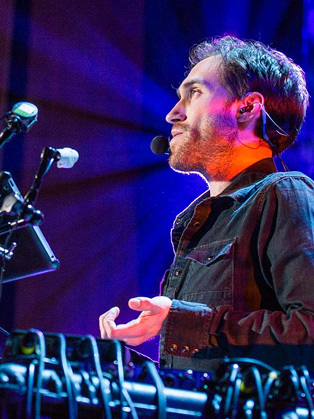 Beardyman is a vocal shamen, Beatboxing champion and live looping pioneer who improvises cutting edge studio quality Dance music in realtime with the help of his world leading, self-designed live music production system, the BEARDYTRON_5000. He has recorded with artists ranging from Herbie Hancock to his global smash Eat Sleep Rave Repeat with Fatboy Slim and is constantly touring clubs and festivals throughout the world. Imagine a machine that can let you record and mix music in real time – one that will enable musicians to get down the ideas in their head instantly, with no filter between the germs of a song and hearing it come alive straight away. Imagine the fevered genius capable of building such a perfect musical aid. Meet the BEARDYTRON_5000mkIV (Beardytron). And meet its creator…Beardyman, whose performances have been viewed over 60 million times on YouTube alone with improvisation being at the heart of the creative process. Chances are, you already know Beardyman. He’s the lovable beatboxing champion, the festival favourite last heard playing the charismatic stoner on Fatboy Slim’s global smash Eat Sleep Rave Repeat, right? Well, yes, that was Beardyman. But the musician emerging from hiding on his startling new album Distractions is virtually a different species altogether. It’s an album a world away from comedy, a multi-faceted collection that takes in blissed-out declarations of love, glitchy electronica and thwacking great big pop songs. What it definitely doesn’t have is straight-up beatboxed pastiches. Three years in the making, Distractions was initially designed to showcase what the Beardytron is capable of. In doing so, it also showed what Beardyman is capable of. Having scrapped plans to release EPs themed around sci-fi based electronica, Balearic-inspired, jump-up dance and his singer-songwriter side, Beardyman has compiled the best songs together on Distractions, before taking out the dance tracks as they didn’t quite fit with the chilled out, uplifting mood that unites the other songs’ vision.